Continuing my weeklong series on Spanish Tapas, today I’m sharing the most deliciously rich and sinful recipe of them all. It is without question the best tasting thing I ever put in my mouth! What is it? all rolled up into one of the best things you will ever put in your mouth. So, let me show you how to make them. 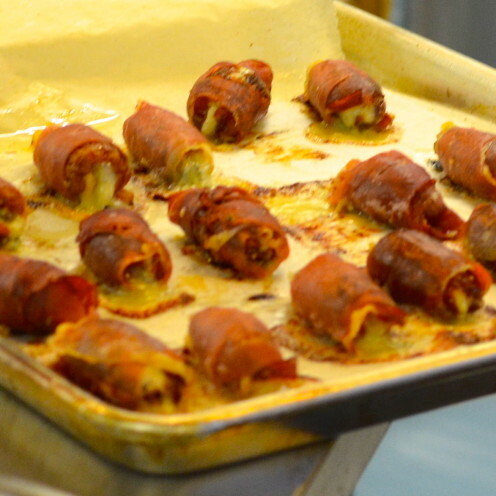 My friend, Chef John, at The Cooking Block, made dates stuffed with blue cheese and peppers for my recent birthday party. 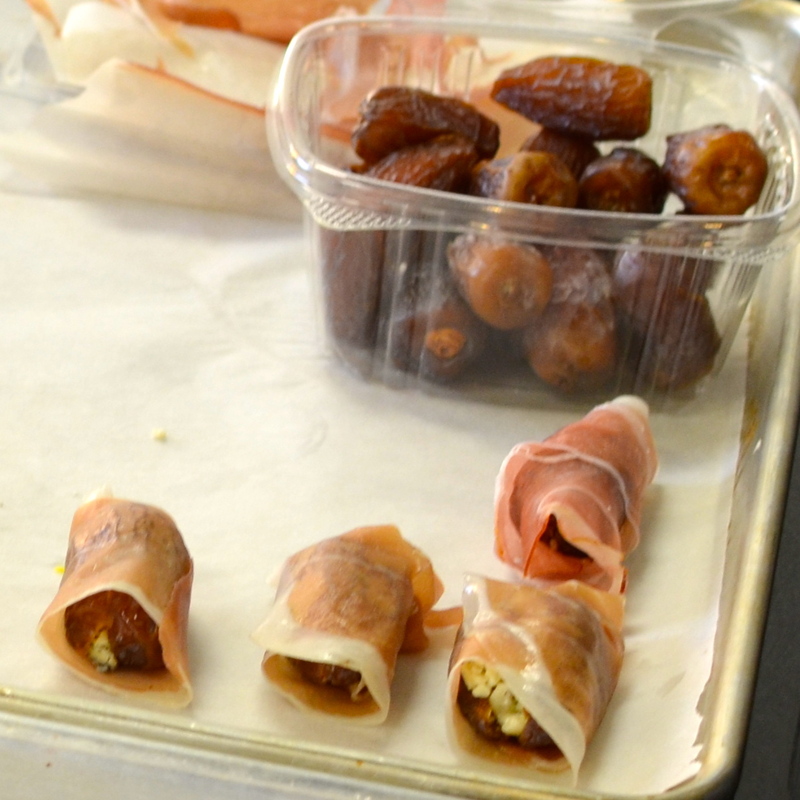 He wrapped the dates in Italian Prosciutto and they were out-of-this-world delicious! But to make them in a more authentic Spanish style, I prefer to stuff the dates with Manchego Cheese, omit the pepper and wrap the whole kitnkaboodle in Spanish Jamon Serrano. We are fortunate that dates grow abundantly in nearby Palm Springs. I grew up visiting the date farms where we tasted the different varieties of dates and then begged our parents to let us order date shakes. My favorite dates are the Medjool, widely considered the finest of all the date varieties. They are soft, creamy and larger than other varieties, making them the perfect date to stuff. Buy them pitted or remove the seed. Replace the seed with a strip of Manchego cheese, then wrap it all up in a thin slice of Jamon Serrano. Place the stuffed dates on a lined baking sheet and bake in a 425° oven until the cheese melts and the Jamon Serrano becomes crispy. Quick, easy and oh so mouth-watering delicious. Now pop one in your mouth and see if you don’t agree with me that it is the best tasting thing you ever put in your mouth! These savory, sweet and crispy little bites of goodness are literally the best tasting thing I ever put in my mouth. Try them and see if you don't agree. Remove pits from the dates. 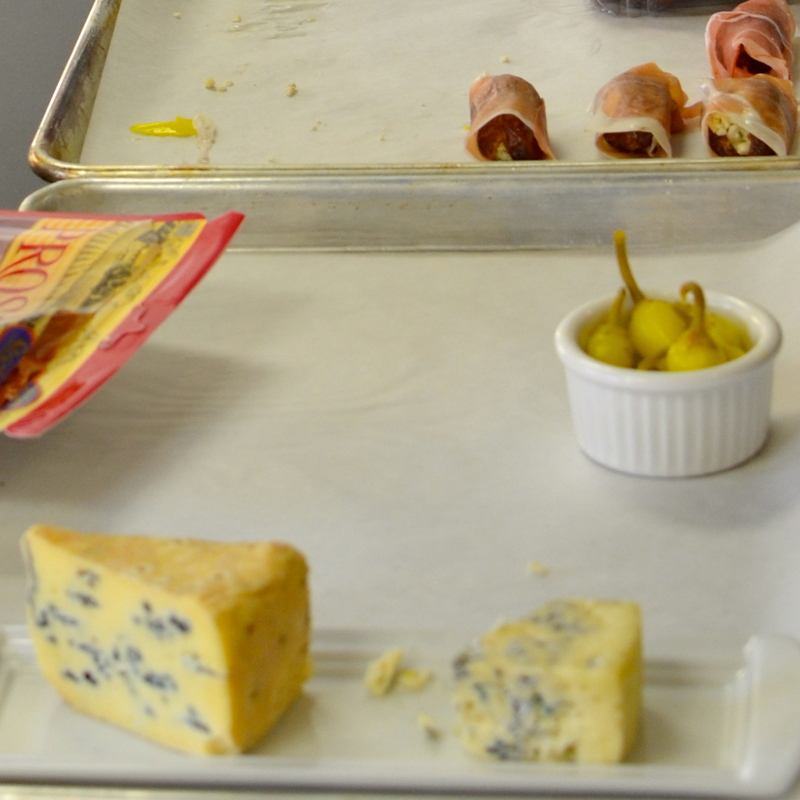 Cut ¼" strips of Manchego cheese the length of the dates. Place cheese inside the dates and pinch shut. 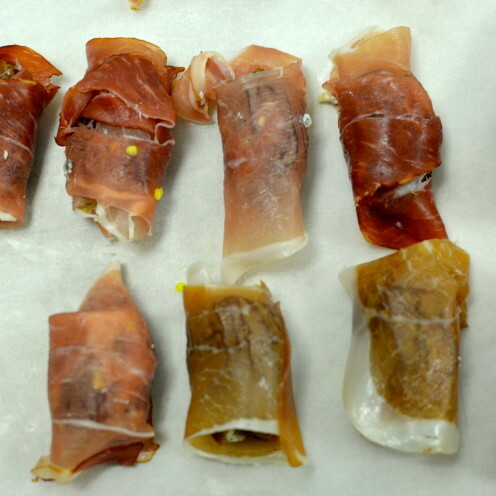 Roll date up in a thin slice of Jamon Serrano. Place dates on a lined baking sheet. Bake for about 5 minutes until the cheese melts and the Jamon Serrano becomes crispy. Jamon Serrano can be purchased in Latin markets or online. Trader Joes also sells a selection of sliced Spanish meats that includes Jamon Serrano. If you can't get your hands on Jamon Serrano, go ahead and substitute it with Prosciutto.